At times arrogant, even downright rude, Hopkins China expert Owen Lattimore vowed to go down fighting in his defense against McCarthy's "moonshine." Opening photo: Lattimore takes on Senate subcommittee members with his wife, Eleanor, behind him. On his right is his attorney, Abe Fortas, later a U.S. Supreme Court Justice. "Don't hesitate to lift a heavy weight; once you make up your mind you will certainly lift it up. There are no impassable mountains and rivers; all depends on your determination. One should never overlook trifling matters. Whether one is respected or despised depends on one's own behavior." It was a day when newspaper headlines "made" the news, and a bullying senator from Wisconsin knew how to grab them. On Monday, March 13, 1950, an inch-high banner headline screamed across the front page of the Baltimore Evening Sun: "M'CARTHY CITES LATTIMORE, THREE OTHERS AS 'PRO-RED.'" Owen Lattimore, then director of Hopkins's Walter Hines Page School of International Relations, was in Afghanistan on a special United Nations mission to offer technical and economic aid to that country. Flying first to Peshawar, Pakistan, and then motoring to Kabul, he had been out of touch for weeks. On March 24, an Afghan messenger stepped out of the cold into a crowded, smoky room. He carried a telegram from the Associated Press. By that time, Republican Senator Joseph R. McCarthy had escalated his charge: In a leak to the press, McCarthy named Lattimore the Soviet Union's top espionage agent in the United States, staking his whole anti-communist crusade on Lattimore's guilt. Lattimore's blunt response to the senator's charges: "moonshine." "McCarthy's off record ranting pure moonshine-stop," Lattimore wrote in a cable to the AP. "Delighted his whole case rests on me as this means he will fall flat on face-stop-exactly what he has said on record unknown here so cannot reply in detail but will be home in few days and will contact you then-stop."then-stop." In 1950, McCarthy was spearheading the inquisition that would bear his name. From the Senate floor's cradle of immunity, the Red-hunting politician had been casting a web of spurious charges and nebulous accusations. In a clenched fist, he waved papers he claimed listed the names of more than 200 Communist Party members working in U.S. government, many in the State Department. Pressed for specifics, he fingered China expert Lattimore and three others, including a former U.S. Navy commander and his wife. Back in Baltimore, Lattimore's wife and fellow East Asia expert Eleanor Holgate Lattimore learned of the charges from a reporter after she answered the phone in their Ruxton home. She quickly fired off a double-barreled denial: "First of all," Eleanor Lattimore told Evening Sun reporters, "my husband has never been a State Department consultant or official of any sort. Second, he has never been a communist or a pro-communist. He is anti-communist." "These charges are so ridiculous," she later added, "yet at the same time so serious." The Dilowa Hutukhtu, or "Living Buddha," with Lattimore, greets Senator Millard Tydings (D-Md.). McCarthyism--a term Owen Lattimore is credited with coining-- would trail the sinologist for more than five years: He was the target of Senate "loyalty" hearings, and a grand jury indictment on perjury charges that were finally dropped in 1955. What happened to the Hopkins scholar along the way tested the limits of academic freedom, the mettle of a nationally recognized university, the ethics of senators, and the patience of a man. All suffered. A half-century later, popular culture seems to include little of Lattimore's story, though other well-known targets of McCarthy, including U.S. diplomat Alger Hiss '26, remain in the public eye as family and fans fight to clear reputations. Many of those who do remember the Lattimore affair remain unclear on the details. Did Lattimore hold tenure at Hopkins, even though he held no higher degree? Did he lie to the U.S. Senate? Was he, after all, a communist? Despite the dropping of all charges against Lattimore, the taint of McCarthy's accusations would follow the scholar to his death in 1989--nearly 40 years later. His story, much of it documented in Hopkins's Ferdinand Hamburger Jr. Archives, shows what can befall a sometimes cantankerous man defending his honor in a repressive era. And the retelling of his tale is sure to invite comment from both emotional supporters and detractors. Though his ideas were shunned by American politicians and policy-makers, some of Lattimore's insights in China and Southeast Asia have nonetheless proven uncannily prescient: Communism, as a form of economy and governance, failed because it couldn't compete with capitalism; the People's Republic of China, being too big to ignore, is becoming a pragmatic U.S. partner in trade. On the 50th anniversary of the scandal, it appears that Lattimore--whatever one may think of his politics--was a reluctant crusader of free, and sometimes belligerent, speech. As a once-vilified household name, he leaves an arresting legacy. In post-millennium America, where McCarthy-style hysteria seems alien and far removed, one wonders whether such repression can happen again. Closer to home, other questions of precedence remain. Did Hopkins do enough to shield free expression in the academy? Lattimore himself highlights the dilemma: What happens to those among us who loudly proclaim unpopular views, repeatedly. We are jogging blissfully along on the road from Chuguchak to Urumchi, and traveling with a husband is a lot more fun than traveling alone. We have done three stages in five days and it doesn't seem to matter whether we ever arrive anywhere or not." --Eleanor Holgate Lattimore, in Turkestan Reunion (1934). Owen Lattimore was a bespectacled, balding scholar, just a bit on the short side, with a penchant for bicycling, loose-fitting clothes, and book-lined offices. He was also a child of China. Though born in Washington, D.C. in 1900 to David and Margaret Lattimore, he left the States a year later. His father, a language teacher, took the growing family to live in Chinese port cities soon after the Boxer Rebellion targeted foreigners in China. Owen lived in China until age 12, when he left to study abroad in Swiss and British boarding schools. He returned in 1919. Lattimore began a lifetime of intrepid travel across China when he started working for Arnhold and Co. Ltd., a British import-export firm. He hardly looked the business-type, arriving in Chinese villages without guide, heavy baggage, or a stash of Western food. He learned much about Chinese politics and economics from negotiations with corrupt officials and exacting traders, and chats with hospitable clerks. His focus shifted to Mongolia on his honeymoon. In 1925, Lattimore, already in love with the Far East, met Eleanor Holgate on a camping trip. She was secretary of the Peking Institute of Art History and also enamored with East Asia. After a brief courtship the couple formed an adventurer's union, marrying on March 4, 1926. "It would be a honeymoon for the ages," writes Robert P. Newman, whose book Owen Lattimore and the "Loss" of China (1992) chronicles much of Lattimore's story. The couple planned a journey through exotic Chinese Turkestan, about 1,600 miles west of Peking (now Beijing). But troublesome pre-honeymoon details intervened, including Chinese civil wars and a rebellion in Inner [Chinese] Mongolia. Since standard routes were dangerous, Owen went ahead via a caravan of camels, agreeing to send word for Eleanor to meet him in Semipalatinsk, a Russian village. She would travel alone, mostly via the Trans-Siberian Railway. Four months later, the new bride got word and took off during the Siberian winter by train and sled, almost missing her husband in the confusion of border politics. For several months, they traveled through Central Asia over ancient silk trade routes to India. During the trip, Owen Lattimore met Mongols victimized by Chinese, Russians, and Japanese. Moved by their tales, he chronicled their stories in his travelogue, Desert Road to Turkestan (1928). Eleanor, in her own memoir, Turkestan Reunion, wrote of days spent riding through deserts and winding canyons, of skirting apricot orchards in bloom, and saddling up at midnight by candlelight. She wondered if they would ever again "live so perfectly or be so free and happy." Like the Lattimores themselves, Owen's scholarly route was unique. In the summer of 1928, when the couple returned to the United States, he applied for a grant from the Social Science Research Council--even though he had done no college work. Isaiah Bowman, head of the American Geographical Society and later president of Johns Hopkins University, was impressed with Lattimore's writings and his proposal to study Inner Asia. Bowman pressed for a grant for Lattimore to study for a year at Harvard University's Division of Anthropology with a follow-up year of research in China, according to biographer Newman. After Harvard, Lattimore was impatient with the quietude of academia and returned to China--where Nationalist Chinese leader Chiang Kai-shek was picking up the revolution begun by Sun Yat-sen. Lattimore did field work in Manchuria and Inner Mongolia with fellowships, including one from the Guggenheim Foundation. In 1934, with grant money gone and a 3-year-old son, David, in tow, the Lattimores counted themselves lucky when Owen landed a job that still allowed him to live in China and travel, as well as exchange ideas with top Asia scholars on the most controversial subjects of the day. Lattimore became editor of Pacific Affairs, a publication of the New York-based Institute of Pacific Relations (IPR), a broad-minded think tank of scholars and others interested in the region: including Britons, Australians, French, Dutch, Chinese and Japanese, and occasionally Russians. It was this job that later attracted the attention of McCarthy and the scrutiny of anti-communist Senator Patrick McCarran, a democrat from Nevada. Though Owen Lattimore was a native U.S. citizen, America would seem, in many ways, to be a foreign country. David Harvey, a Hopkins professor of geography and environmental engineering whose research focuses on Marxism, pointed out in a 1983 article in the journal Antipode: "If Lattimore is guilty of anything, I suspect it was simply that he knew the realities of China too well and that he sought to convey them to an America which he understood too little, largely in terms of its own surface idealism. His whole deportment during the McCarthy period testifies to his shocked disbelief that such an outrageous violation of the spirit of American constitutionality could so easily be inflicted upon him." "My comments and interpretations have always been so independent that I have in my time been criticized by Chinese, Japanese, Germans, Russians, and Mongols, as well as by intemperate Americans. . . . The criticisms run all the way from calling me an arch-imperialist to calling me a Red." -- Owen Lattimore, in a 1945 article in China Monthly. In 1938, there were few clouds to foretell the impending storm. Bowman, who had become the university's fifth president in 1935, lured Lattimore to the university, hiring him as a lecturer in the Page School of International Relations at Homewood. A year later, Lattimore was appointed director of the school, a graduate studies program named for a Hopkins alumnus, journalist, and ambassador to Britain during World War I. The school, which had struggled to secure funding, was in need of a charismatic leader. In 1939, based on the depth of his scholarship, Lattimore was granted "indefinite tenure" despite his lack of a PhD or higher degree. It's unclear how formal and official that tenure was, but it was enough to protect him later. Lattimore was viewed as a down-to-earth teacher and, in pre-McCarthy days, an unobtrusive presence on campus. Mongolia, a less-than-hot area of international study, was nonetheless drawn into the spotlight by his work on the region, including Outer Mongolia (now Mongolia), a border country lodged between China and Soviet Russia; Lattimore, working with the U.S. Embassy, helped bring some of the first Mongolian scholars to the States, including an old friend, the Dilowa Hutukhtu, or "Living Buddha." At Hopkins, two young Mongolian researchers, Gombojab "John" Hangin and Urgunge "Peter" Onon, worked to create the first handbook of the Mongol language ever issued in English, among other projects. The third scholar, the Dilowa--a high dignitary in the Lama Buddhist Church--became a famous robed figure on campus. At one point, after wandering south into the city, the 66-year-old man, who spoke no English, was picked up and taken to a Baltimore City police station where officers tried to determine whether he was an illegal alien. When he kept saying the name "Lattimore," the officers finally called the Hopkins scholar. Lattimore openly doubted America's ability to alter the fate of Asia in terms of communism. Lattimore also was able to keep his hand in China: In 1941, he took a leave of absence to serve as a political advisor to Chinese Nationalist leader Chiang Kai-shek, who appointed Lattimore on the advice of President Franklin D. Roosevelt; for two years starting in 1942, he directed Pacific operations at the U.S. Office of War Information, which broadcast pro-American news and commentary; and following the end of World War II in 1945 he went to Japan as an economic consultant for the U.S. Reparations Mission. Through the decades, he lectured and spoke widely, publishing several books, The Making of Modern China (with Eleanor Lattimore), Solution in Asia (1945), and others that contained some conclusions his accusers would later cite as pro-communist. Among other views, he began to challenge the leadership abilities of Chiang Kai-shek, who was nonetheless ardently supported by Americans on the right known as the "China Lobby" as a viable force to counter communism. In 1949, a defeated Chiang Kai-shek fled to Formosa (now Taiwan). By the late 1940s, the world had become a threatening place for many Americans: Following World War II, the Soviet Union had turned from ally to enemy and Mao Zedong-led communism rose in China. There were fears the "domino effect" of communism would topple country after country throughout Asia. Many in the United States looked for somewhere to lay blame. What would become known as the "Who Lost China?" question focused on China scholars and policy advisors--many would be purged whether their views had been heeded or not. Lattimore himself bore unwelcome news, openly doubting America's ability to alter the fate of Asia in terms of communism. He figured the Chinese and others controlled their own fates. Lattimore also did not hesitate to tap different political "camps" if he thought the analysis was practical and accurate. After the war he advised a purge of Japanese industrialists, the Zaibatsu, to depower that nation's future military and give more power to the common people. While editor of Pacific Affairs, he published articles by writers sympathetic to Russia's Marxist cause, and some favorable to Stalin, which he later said was an effort to balance the dialogue. Yet in perhaps his gravest error, he misjudged the Stalin purge trials, editorializing in Pacific Affairs that abuses in that government had been discovered and rectified. These writings, in particular, would come back to haunt him. He also admitted that in impoverished countries like Outer Mongolia, socialism improved some elements of life--in terms of security, economic prosperity, free education, and other measures. He warned that if America didn't tread lightly in Asia, it might push nations toward the Russian alternative. Then, in a 1948 speech and other venues, he threw down a gauntlet. "It is time the United States faced the fact that Russian power and Russian ideas cannot be totally excluded from Asia," he said. "Instead of trying to stop Communism, we must swing over to a policy of competition." He blamed policy problems in China on "fire breathers in the 80th Congress" and "tom-tom beating in the jingoistic press." Described by some modern scholars as a man of strong opinions, carelessly expressed, he nonetheless asserted that communism was not the preferred course. "I do not believe that a spread of Communism anywhere in Asia (or indeed Europe or America) is either inevitable or desirable. . . . More than that, I believe that the country which most people in Asia would like to imitate and emulate is America rather than Russia," he wrote in a response to critics in the December 1945 issue of China Monthly. In March 1950, just after McCarthy leveled his charges, Hopkins's own student newspaper, the News-Letter reviewed his record: "Mr. Lattimore's statements have never shown approval of the Communist regime in China but in several instances he found Communist policies more desirable than those of the completely militant nationalists. As a historian, moreover, it has been impossible for him to ignore the near inevitability of Mao Tse-Tung's routing of the nationalists." That wasn't patriotic enough by the standards of the day, and Lattimore was caught in an ideological crossfire. Any outspoken acknowledgment of communism's positive points--or finger-pointing at members of Congress when Congress was busy blaming the universities and State Department--was enough to brand him a potential spy and Public Enemy No. 1. And McCarthy, obsessed with the threat of U.S.-based communist conspiracies, was glad to fire up the brand. "My first reaction was an anger so hot and sweeping that it was hard to think." --Owen Lattimore, Ordeal by Slander, his 1950 book about the McCarthy hearings. When Lattimore drafted his cabled response to the AP telegram, he didn't exactly control his temper. The cable "would have to hit the front pages and hit them crisply. Clearly, this was going to be a fight to the finish, and a knockdown drag-out fight," he wrote in Ordeal by Slander. "I had as yet no conception of the personality of McCarthy; but if he was a man who was willing to make a totally unfounded charge of espionage, this was going to be a dirty business." During a stopover in London, he read an anguished letter from Eleanor. "My darling, I don't know if I'm in Moscow or the moon. It certainly isn't the United States," she wrote. "I have heard more fantastic and terrifying things in the last twenty-four hours than could happen in a nightmare." 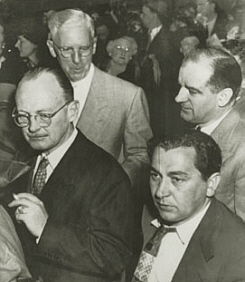 Lattimore (l), long a chain smoker, and McCarthy (upper right), said little to each other during the hearings. 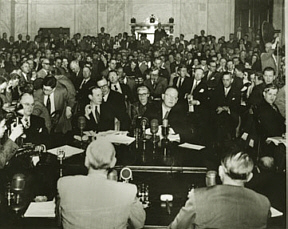 Lattimore kept his Page School directorship at Hopkins during the McCarthy hearings of spring 1950. When Detlev W. Bronk, then Hopkins president, first heard McCarthy's accusations of espionage he told the Evening Sun "that's news to me." Bronk said he was sure Lattimore would "be quick to deal with the charges." When Lattimore returned home, his public denial was filled with bold barbs and haughty anger. "The Soviet Union ought to decorate McCarthy for telling the kind of lies about the United States that Russian propagandists couldn't invent," he said. "As for myself, I, of course, bitterly resent this nonsense. No one likes to be splattered with mud, even by a madman." McCarthy's case, which unfolded in a series of fits, starts, and leaks, followed a convoluted line of attack. He cited findings in FBI documents he said would prove his case and claimed he had witnesses who could link Lattimore to the Communist Party. (FBI records released in the 1970s questioned the credibility of witnesses and revealed that the FBI had found no real evidence against Lattimore, according to Newman and others.) Leading the witnesses was Louis Budenz, a former newspaper editor and ex-communist, who had never met Lattimore but knew about him through contacts. Budenz first said he knew Lattimore to be a Soviet-advised communist and later amended that, saying he belonged to a "communist cell" of writers whose ideas followed the communist line. William Zartman '52 (MA'52), who was a managing editor of the News-Letter, went to the hearings. Says Zartman, now Hopkins professor of international organization and conflict resolution: "We were watching our gladiator. [Lattimore] was a good academic doing his thing and we felt that McCarthy was a Nazi in modern form." The Lattimores, always intrepid in travel, tackled this crisis as another challenge. Defense strategy meetings at home were campaign-like, with Eleanor in the thick of it all; Owen and Eleanor laughed heartily for newspaper photographers. In mid-April, Owen Lattimore sat before microphones at one end of a T-shaped table and plopped a fat, 42-page statement in front of him. He adjusted his spectacles, according to Time magazine, eyeing his accuser. McCarthy smiled indulgently back. Though many McCarthy targets meekly handed over names or took the Fifth Amendment, Lattimore instead put on the gloves. The 49-year-old scholar challenged McCarthy to step out from behind congressional immunity to make the charges. Lattimore and his attorneys vowed to sue the senator for slander. In a now famous exchange, he said the whole question raised by McCarthy centered on America's best course in China. He again urged the U.S. to encourage Chinese nationalism--even if it be communist nationalism--in the hope of making a Tito out of Mao; or, preferably, to support a democratic force within in China. "Now, gentlemen," said Lattimore. "My analysis of this may be partly or wholly wrong. But if anybody says that it is disloyal or un-American, he is a fool or a knave." Lattimore looked squarely at his accuser. "Let Senator McCarthy take note of this." The tide against Lattimore seemed to be reversing. On April 6, Senator Millard Tydings, the Maryland democrat who chaired the subcommittee hearings of the Senate Foreign Relations Committee, announced that a review of FBI files in the presence of Director J. Edgar Hoover put the scholar "completely in the clear." "He addressed U.S. senators with great condescension and corrected the grammar of interrogators." But McCarthy didn't quit and the hearings went on for weeks, the drama snaring the nation. When ex-communist Budenz was set to speak, the chambers were so crammed with tourists, Capitol spectators, senators, and reporters, that Eleanor had to sit on the floor. Their son, David, then an English major at Harvard, attended in a new tan suit. Owen Lattimore took the junior senator from Wisconsin to task, using his self-defense as a podium to lecture McCarthy and America on Asian history and politics. A newspaper editorial cartoon depicts Lattimore as a scolding teacher, shaking a ruler at a sweating, 5 o'clock-shadowed-McCarthy. A "Handy 25-cent Guide to Asia" peeks out of McCarthy's coat pocket. "He addressed U.S. senators with great condescension and contempt and corrected the grammar of interrogators," remembers David Lattimore, now professor emeritus in classical Chinese studies at Brown University. "To him, it was sort of damned if you do, damned if you don't. He could have been suave and subtle, but he felt that McCarthy in particular was a completely unprincipled man. He said he never hated Joe McCarthy, he was just what he was, a barroom brawler out of his depth." Back at Hopkins, while Lattimore remained under suspicion, faculty and students turned out in the third week in May for a rally. A faculty-led dinner in his honor at the Hopkins Club was set for 50 colleagues. From the club, the group walked over to Levering Hall, where a reception was supposed to be limited to a few hundred. But before 8 p.m., people who had not gotten "tickets" were darting about campus looking for professors to get them into Levering. As many as 600 students and faculty showed up, and loudspeakers carried the address to people outside. Lattimore got a standing ovation. Ross Jones '53, who had taken Lattimore's courses on China, attended the packed rally. "I was way in the back and standing on tiptoes and looking in the Great Hall," says Jones, now Hopkins vice president and secretary emeritus. "I remember being really moved by the faculty coming together for a show of support." Boas, who didn't then know how long the case would go on, said that night: "Many of us thought heresy trials were things of the past. . . . The cloud of poison gas spreading over the country has not yet smothered the faculty of the Johns Hopkins University who remain faithful to their university's motto, The truth will set you free." In July, the Tydings committee report cleared Owen Lattimore: "We find no evidence to support the charge that Owen Lattimore is the 'top Russian spy' or, for that matter, any other sort of spy." Tydings labeled McCarthy's case "a fraud and a hoax." But emerging politics would continue to paint an alarming landscape. On June 25, 1950, when Kim Il-sung launched North Korean forces into South Korea, American soldiers were drawn into the Korean War. Fear of communism surged at home. Tydings was voted out of office during the fall 1950 election, with McCarthy helping the opposition. Congress leaned to the right, and McCarthy kept the cross-hairs on Lattimore. Another Cold War warrior, Senator McCarran, was still convinced that Lattimore was the chief architect behind America's failure in China. Things would get worse. Letters poured in to the university, most denouncing Lattimore. I see by the news journals that Johns Hopkins has reinstated that foxy character, Owen Lattimore. Thus does the Biblical Dog return to its vomit. Today William Christian Bullitt testified under oath that in 1939 the prime minister of France, Daladier, informed him that ALGER HISS, THE DISTINGUISHED ALUMNUS OF JOHNS HOPKINS, was a Russian spy. Mr. Bullitt also gave information on THE JOHNS HOPKINS PROFESSOR, the phony Doctor Lattimore (who is only a grade school graduate as he did not even graduate from high school). Don't you think it high time to clean the traitors out of Johns Hopkins? Also it is high time for you to resign and make way for a decent and patriotic American in your Red-infested University. Over the period of years Professor Owen Lattimore has only tried to do what every scholar should, namely to investigate all sides of a problem.... He is not a Communist and he has not been engaged in subversive activities. All of his answers were not tactful and some of them may have been inconsistent, but could any of us be questioned for 11 days on the minute details of his activities during the previous 10 years and never contradict himself? "If I smiled at all, it was certainly a non-Communist smile.... I thought that these grim conspirators regarded a smile as a bourgeois gesture--practically as an enemy of the state. If I am wrong, and if a smile is a secret Red signal, I confess that I used to smile a great deal. In the pre-McCarthy days I used to think that life was lots of fun." --Lattimore's response to an accusation that he acknowledged a colleague's communist affiliations with a knowing smile. Aweek before New Year's 1951, the Senate Internal Security Subcommittee (SISS), chaired by McCarran, was formed to investigate the Institute of Pacific Relations, and Lattimore's editorship at Pacific Affairs, to build a case against him. The committee, which learned about IPR records stored in a barn near Lee, Massachusetts, would use details in the records to question Lattimore about past dates and events, and to lay a perjury trap. In the last half of 1951, McCarran's subcommittee launched a rehash of the McCarthy allegations, featuring the ex-communist informer Budenz. Byzantine arguments bogged down over such points as whether Lattimore ever called the Chinese communists "agrarian reformers." Former Soviet citizens and academic critics gave additional testimony against Lattimore. Most of their remarks centered on analyses of Lattimore's writings, or remembered phrases from snatches of conversation. The committee again analyzed Lattimore's influence on U.S. foreign policy in China by combing memos he had written. An increasingly frustrated and enraged Lattimore then asked for a hearing before the subcommittee to clear his name. Long a chain smoker given to nervous gestures, he developed a facial tic that followed him to the end of his life. Friends observed that he and Eleanor had aged noticeably, hair graying, faces creasing. Lecture invitations and social calls dried up, according to Newman. In 1949, Lattimore received more than 100 invites to speak. In 1951, there were three. 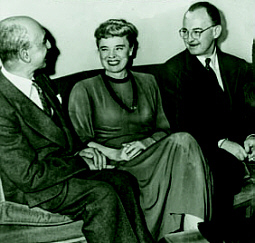 Eleanor and Owen Lattimore, often pictured beaming during the crisis, speak with Hopkins's George Boas. On Feb. 26, 1952, Lattimore sat down with a 50-page, 17,500-word statement he had given to the press. Before he could read two paragraphs, he was subjected to a drum fire of senators' questions. In one exchange reminiscent of the trial in Alice in Wonderland, Senator Willis Smith (D-N.C.), challenged Lattimore's charge that the witnesses against him were not being cross-examined for veracity or motive. "But aren't you a witness Mr. Lattimore?" "Well, aren't we cross-examining you?" Smith concluded. "Well, then, we do cross-examine our witnesses, don't we?" After the first of a relentless 12 days of questioning, Lattimore was overheard by a reporter as he walked down a corridor with his wife: "Well, if I'm going down, I might as well go down swinging." He would swing even harder than before. Lattimore's written statement--his refutation of charges, his reassertion that he was not a communist, and his insistence that he had little influence on U.S. politics because few leaders did what he suggested--was also rife with sarcastic asides. In his outline, he heads Section V: "Regurgitation of Charges disproved by Tydings investigation shows change in cast of characters. Additions: a vague Red General and a crackpot professor." He told the committee, "I should, in fact, be less frank if I did not confess that I see no hope that your committee will fairly appraise the facts." And he charged senators with "instituting a reign of terror" among foreign service personnel. A stung McCarran read an unusual statement at the conclusion of Lattimore's testimony. "The committee has been confronted here with an individual so flagrantly defiant of the United States Senate, so outspoken in his discourtesy, and so persistent in his efforts to confuse and obscure the facts, that the committee feels constrained to take due notice of his conduct." Eugene Sekulow '53 (MA '54, PhD '60), then a graduate student in political science, attended the hearings. He had studied with Lattimore, and kept in touch over the years. "Lattimore answered stupid questions by indicating that he thought they were stupid," Sekulow remembers. "He did not tolerate fools in his class. Why should he tolerate them in Congress?" Though some Hopkins faculty and others praised Lattimore's bravery, his blunt criticism of subcommittee members, and his overall demeanor, would be viewed as going too far. He had violated the decorum expected of a professor, and sympathy for the beleaguered scholar started to wane in the press and on campus. "Many people said he was literally arrogant before the committee, unforgiving in his views and sarcastic," says M. Gordon "Reds" Wolman '49, now Hopkins professor of geography and environmental engineering. Should he have been more diplomatic? "If you are careful with some people, you could come out better. Personally he might have done better, but you can't know. The best civil rights people say, 'Don't be a coward.'" Says David Lattimore, now 69, "My father did not look at these as bona fide Senate proceedings for a legitimate purpose with legitimate evidence. These were not people behaving in such a way they deserved to be treated with the respect due statesmen." Lattimore was now in danger of being censored, or punished, for unpopular speech of another kind. "The fact could hardly be ignored that Lattimore had greatly alienated and with his obduracy continued to alienate many people," wrote Lionel S. Lewis, in The Cold War and Academic Governance: The Lattimore Case at Johns Hopkins (1993), which provides an in-depth look at what unfolded on campus. "Not the least of these was an increasing number of the more prominent members of the board [of trustees] who had become convinced that [Lattimore] was injuring the university, which was seen as quite vulnerable." Letters started to flow into Hopkins, most denouncing Lattimore, others praising Hopkins for showing restraint and supporting academic freedom. Yet the university was under an intense amount of pressure to fire him, and many of the notes that ended up in the president's office were glib or angry. One penny postcard bearing the stamped profile of Thomas Jefferson noted: "What is the possible reason for Johns Hopkins allowing a highly questionable character like Owen Lattimore to hold a professorship? He is an ugly duckling with pink feathers which are turning red, Disgustingly yours, Semper Paratus, Astoria, N.Y."
With some alumni threatening to cut off donations, the board of trustees split over what to do with Lattimore. One trustee, Jacob France, resigned, withdrawing his financial support. Although a few members drafted a resolution to fire Lattimore in 1952, the board held off. It did, however, pass a resolution denouncing communism on campus, according to Lewis. The national controversy would spark other intrigue at Hopkins. In early 1952, Lattimore publicly named a McCarthy informant: his colleague George F. Carter, Hopkins professor of geography and department chair. And a fateful picnic at the Lattimore house entered Hopkins lore. Nearly seven years earlier, the Lattimores had hosted a June cookout at their Ruxton home. Invited were Carter and his wife; Professor Malcolm Moos and his fianc�e; and two friends from Washington, writer Andrew Roth, of the Office of Naval Intelligence, and John Steward Service, a State Department diplomat. Roth had just completed a book on Japan and wanted Lattimore to look at the proofs. The group ate hamburgers and admired Chinese art objects in the house. But what Lattimore didn't know was that the FBI was tailing Roth and Service, who were arrested three days later in connection with the 1945 Amerasia stolen documents case, in which classified reports were allegedly passed to the left-wing magazine. (No evidence of espionage was found; Service was dismissed from the State Department, but a Supreme Court ruling later allowed him to return.) Carter reported clandestinely to McCarthy that Lattimore, Roth, and Service had conferred over questionable documents, according to Newman. When Lattimore branded his colleague an informer in 1952, Carter became a pariah on campus, Wolman and others say. Other faculty, however, shared a growing distaste for Lattimore, and many a faculty meeting or affair became polarized. Wolman, who had returned to Hopkins in 1958 as chair of the department where Carter remained a professor, invited Lattimore to again lecture in geography. Carter and Lattimore avoided each other like two negative charges. "It was a very, very difficult scene," Wolman remembers. "If there was some faculty event and one was there and the other appeared, one would disappear instantly." Carter had been a mentor to Wolman when he was a student of geography in the late 1940s. Wolman thinks Carter would have thought reporting Lattimore his civic duty: "George believed that there were forces undermining the strength, capacity, or value of the United States of America." Partly to ease faculty and other tensions in spring 1952, President Bronk appointed a committee of eight faculty to consider Lattimore's testimony and propose solutions. The group, called the Bard committee after its chair (physiologist Philip Bard, later appointed dean of the School of Medicine), finished its report in May. Committee members noted that if Lattimore was found guilty in court, the university should dismiss him. But because the university had granted Lattimore tenure, "whether that appointment is a mistake or not is immaterial," the group also pointed out that he should be reinstated if acquitted. Meanwhile, he should be kept on paid leave. The committee also agreed that Lattimore's conduct was "deplorable" but wasn't cause for dismissal because he was acting on the advice of his attorney. Besides, they pointed out, he was being "quizzed mercilessly on events of ten or more years ago." The faculty members did, however, note that Lattimore had "clearly challenged the committee by his provocative statement. After that he had to expect unsympathetic treatment." In July, the Senate subcommittee recommended indicting Lattimore for perjury. On December 16, 1952, after continued lobbying by McCarran, a federal grand jury returned a seven-count indictment against Lattimore on charges of perjury--the first being that he lied under oath when he denied he had promoted communism or communist interests. (A similar tactic had worked against Hiss, former assistant to the head of the Far Eastern desk at the State Department. Hiss, a Phi Beta Kappa student whose time at Hopkins did not overlap Lattimore's, was convicted of perjury in early 1950.) Bronk immediately put Lattimore on leave with pay, with approval of the trustees, until the case was resolved. To this day, faculty, alumni, and others have debated whether Hopkins responded appropriately when one of its own was attacked. Should Lattimore's brand of free expression have been better defended? "The university could have been more forthcoming and stood behind Lattimore," says alumnus Sekulow, a retired executive vice president with Bell Atlantic/Nynex. "The administration took a neutral position, and to me that was the same as being opposed to him." Richard Macksey '53 (MA '53, PhD '57), Hopkins professor in the Humanities Center, noted that McCarthyism put academics under the gun. (Some universities, including Tulane, were later criticized for dismissing tenured "left-wing" professors.) "I think [Hopkins] was probably honorable," Macksey said. "They defended him simply by putting him on leave. Some people would say they took him out of the classroom and that was censorship. I think not. I think it was the humane thing to do while he had to defend himself in court. . . . I think the university maybe didn't look as heroic as it might have, but I think it came out pretty well on the Lattimore issue." Chester Wickwire, Hopkins chaplain emeritus and a civil rights activist who has long courted controversy, arrived on campus in the early 1950s. During the hearings, Wickwire tried to arrange for Lattimore to speak at Levering Hall on academic freedom, but he was barred: Hopkins administrators "were supportive in the sense that they paid his salary, but they didn't want him speaking around," Wickwire remembers. Unpopular speech often does not make one popular and Americans-- who loudly tout free speech protections--may be only so willing to stand up for someone's right to be annoying. "Lattimore was a prickly person," Macksey notes. "But was indeed a scholar and indeed a person who was abused in the press [and] before Congress." At University of Leeds in England, Lattimore was lauded for standing up to that Yankee madman, McCarthy. "To require a defendant to go to trial for perjury under charges so formless and obscure as those before the Court would be unprecedented and would make a sham of the Sixth Amendment." --U.S. District Court Judge Luther W. Youngdahl. By the mid-1950s, McCarthyism was waning and Americans were getting used to the Cold War. Lattimore the scholar was fading from the spotlight. After a series of perjury count dismissals, Justice Department appeals, indictments on new counts, a petition to remove the judge, and other tortured judicial proceedings, Lattimore was finally in the clear by summer 1955 when the Justice Department, faced by an increasingly unlikely chance to gain a conviction, dismissed the charges. It was too late for Lattimore. In 1955, Lattimore was restored to duty as a lecturer in the Department of History, and was grateful for the support of fellow faculty. In the years that followed, he still made headlines offering advice on international affairs, including America's troubled role in Taiwan, and continued his crusade to expand Inner Asian studies on campus. But wounds from the McCarthy era turned into scars. Warren Silver (PhD '53) heard Lattimore speak before and after the scandal. "I noticed that toward the end it seemed the poor fellow was a broken man, quite changed," Silver says. "He was very hesitant in his delivery, not with the same confidence." Despite the demise of McCarthyism (McCarthy himself would be censured by his Senate colleagues for unbecoming conduct in 1954), fear and persecution of left-leaning, or radical, academics would last into the 1970s and beyond. "You should never underestimate how fast moral and political panics can seize this country," says Harvey, who says his Marxist interpretations of geography have gotten little support. "At this particular moment, I don't see possibilities down [ideological] lines. But now there's a more sinister process, the university is becoming more of a corporation with money behind it. Money power doesn't fund dissident research." He adds: "What do I do, start up the Center for Marxist Studies funded by General Motors?" Dismayed by academic constraints he perceived in America, Lattimore left Hopkins in 1963 to direct the newly formed Chinese Studies program at the University of Leeds in England, where he had a distinguished career and was lauded for standing up to that Yankee madman, McCarthy. But he was yet to face his worst crisis. When Lattimore retired from Leeds in 1970, he and Eleanor planned to live in a Virginia house Eleanor had designed. But she died suddenly, suffering an embolism just after their plane home landed at Kennedy Airport in New York. The 44-year honeymoon was over. "He was really flourishing in England until my mother died," David Lattimore remembers. "He had a hard time, he was very dependent on her. They did everything as a team. " For years, an increasingly melancholy Owen Lattimore said little publicly about Hopkins's role in the affair. Yet, as he gained the sort of irreverance a man in his 80s feels toward a receding world, he became more outspoken on that point, too. In 1984, five years before his death, he described Hopkins's actions as a dodge: "Don't fire the professor, get rid of the department," he told People magazine. The old China hand "seemed to feel the Hopkins administration blamed him in some way for what happened," Harvey says. "Even though they didn't fire him, he was made to feel culpable." Yet when Lattimore gave a farewell lecture to a packed Shriver Hall auditorium in 1963, his message was clear. He wanted to be remembered for other things. "The people who came had an idea he would speak about McCarthyism, of the trials and tribulations of the era," remembers Wolman. "He did no such thing. He spoke about Mongolia, about horse racing and poetry--how Mongolians won races not just on how well their horses did, but on how well they wrote a poem. "There were probably three people in the audience, other than Eleanor, who had any notion about what he was describing," Wolman says. "Again, that's a measure of an independent mind. He chose to do what he chose to do." Joanne Cavanaugh Simpson ( jpc@jhu.edu) extends special thanks to the archivists at MSE Library and Hopkins historian Mame Warren, whose interviews contributed to this story. RETURN TO SEPTEMBER 2000 TABLE OF CONTENTS.